PS4 Dual Controller Charging Station - Moar Stuff - You don't need it but you know you want it. 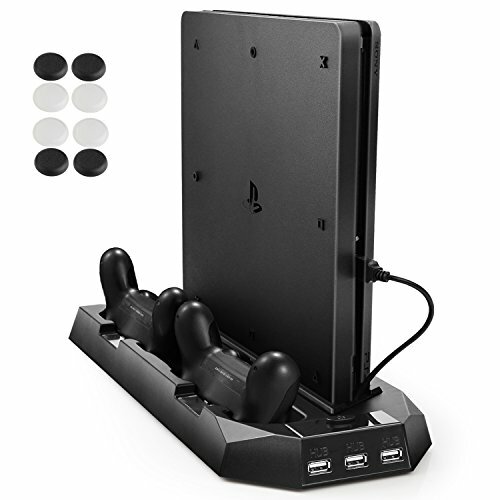 Organize your PS4 and keep the controllers charged at the same time with this vertical stand. 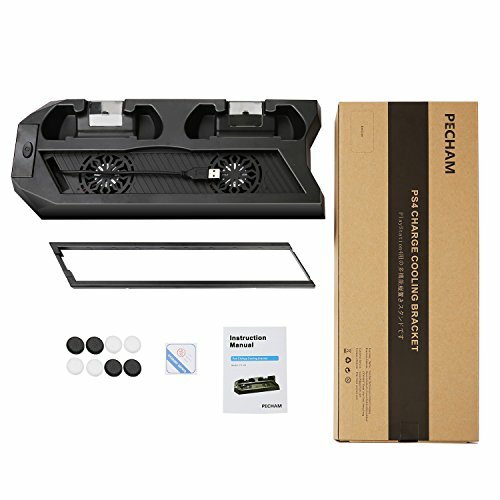 [Dual Cooling Fans] This vertical stand has 2 built-in fans to dissipate heat from your PlayStation 4 / Slim Console keeping it working functionality. 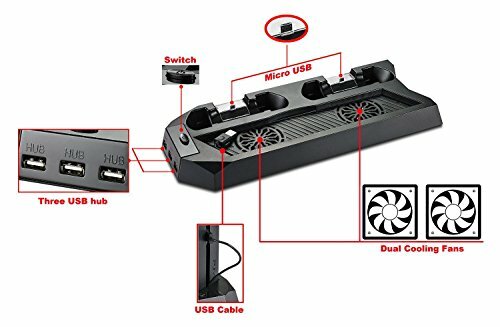 No need to worry about your PS4 / PS4 Slim overheating and burning your table from long hours of game playing. 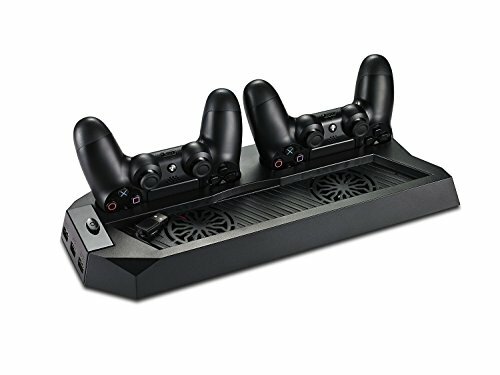 [Dual Charging Station] The stand has 2 slots for holding the controllers when you are not using them or when they are being charged. You can charge your DualShock controllers simultaneously, saving your time when need to charge the controllers. 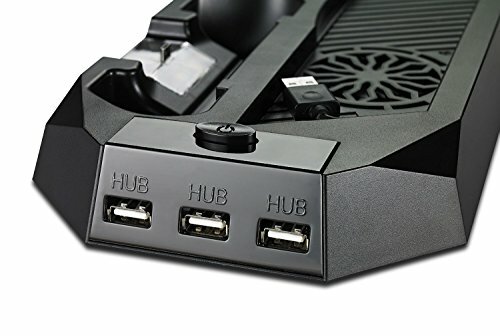 [Multifunctional] It has added 3 HUB ports to charge or power up other devices you may need to play the game with, or to connect other devices like tablets, phones, and cameras. 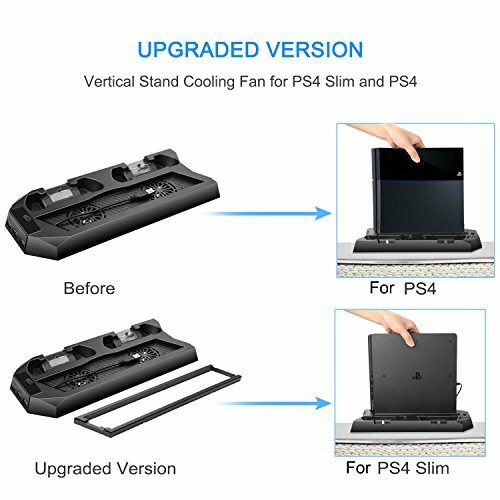 This vertical stand has 2 built-in fans to dissipate heat from your PlayStation 4 / PlayStation 4 Slim so, no more worrying about your PS4 overheating and burning your table from long hours of game playing. Because, let’s face it, who only plays for a few minutes, really? The stand has 2 slots for holding the controllers when you are not using them or when they are being charged. You can charge your DualShock controllers simultaneously, saving your time when need to charge the controllers. No more getting time to play only to have a dead controller. It also offers a trio of additional HUB ports on the front of the stand. That way, you can charge or power up other devices you may need for play. You can also use them to connect other devices like tablets, phones, and cameras. The stand keeps the gaming area neat and compact and actually minimizes the space taken up by your PlayStation by holding it vertical. So, go ahead and order yours now. You’ll be glad you did the next time you have time for an epic gaming marathon and you can not only find your controllers but they’re also both charged!!! Dimensions: 14.4 x 5.9 x 1.5 inches (365 x 150 x 38 mm). Weight 14.1 ounces (398 g). Uses dual 70 mm fans for cooling the console. Can charge two DualShock controllers at the same time. Provides 3 HUB ports conveniently located on the front.